If you're looking for a light, yet rich and indulgent dessert, then cannabis tiramisu could be the one for you. This delightful recipe uses cannabis-infused whipping cream to turn a classic Italian recipe into a creamy, psychoactive wonder. Tiramisu is an Italian classic combining coffee, alcohol, and now, cannabis. If you ever get the urge to stretch your cooking skills a little further, or if you simply appreciate the finer things in life, then this creamy dessert is essential for you. It is quite an adaptable recipe, so don't be afraid to try out different combinations of chocolate and liqueur if you're feeling creative. Give yourself enough time to cool the cream, sabayon, and sauce prior to putting together the full recipe. You will also want to use decarboxylated kief or hash in order to convert the THCA in your bud into psychoactive THC. 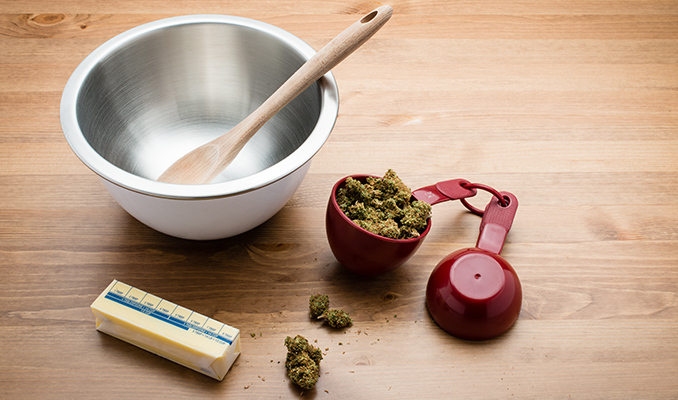 Simply add around 2 grams of cannabis into a saucepan with heavy cream over medium heat. Stir constantly until the kief or hash is entirely infused into the mixture. Take off the heat and allow to cool completely. Now, you can use your preferred method to whip the cream, whether that involves an electric mixer or your two hands and a whisk. Combine egg yolks and sugar in the top of a double boiler over boiling water, or use a metal bowl over a pan if you don’t have one. Reduce the heat to low and stir constantly for 10 minutes. Remove the mixture from the heat when it turns glossy. Now, whisk thoroughly until the mixture looks thick and turns a lemon yellow colour. Beat mascarpone into the sabayon mixture until combined, and set it aside. Use a separate bowl to whip your cannabis-infused cream to stiff peaks, and then gently fold it into the mascarpone and sabayon mixture. Mix cold espresso with dark rum or coffee liqueur and dip ladyfingers in the mix enough to moisten them slightly. Be sure not to soak them! Place ladyfingers in the bottom of a square baking dish or small container (around 23cm) and then spoon half of the mascarpone-sabayon filling over it in a smooth layer. Repeat this process with another layer of ladyfingers and filling. Refrigerate your tiramisu for a minimum of 4 hours. Combine your favourite selection of fresh berries with sugar and water into a pan over high heat. Stir consistently as the mixture comes to a boil, then turn down the heat to medium-low, adding the lemon juice and orange liqueur. Stir occasionally until your mixture thickens to a point where it coats a metal spoon. Now, remove from heat, and store in the fridge until cool. Remove your chilled tiramisu from the fridge and dust with cocoa or grated chocolate before serving with a spoonful of summer berry sauce and fresh berries. You should be able to get about 9 pieces of psychoactive, THC-rich tiramisu! Remember, this will taste great, but don’t eat more than you can handle!